in any, are pecuUarly indecent and unbecoming ui the Chief Magistrate of theUnited States, by means whereof said Andrew Johnson has brought the highoffice of President of the United States into contempt, ridicule, and disgrace, tothe great scandal of all good citizens, whereby said Andrew Johnson, Presi-dent of the United States, did commit, and was then and there guilty of highmisdemeanor in office. 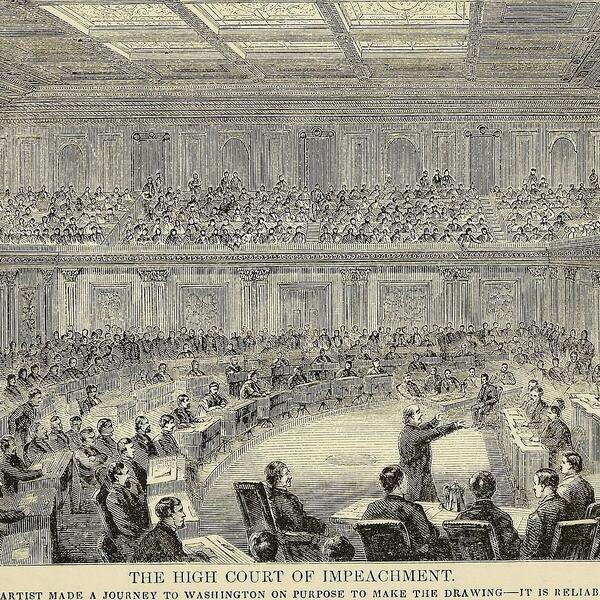 The Senate having adopted rules for the trial, reported by-its committee, proceeded on Thursday, March 5th, to organizeas a Court of Impeachment, Chief Justice Chase presiding.On Saturday, March 7th, the summons requiring the Pres-ident to api)ear and answer the Articles of Impeachment wasserved on him, with a copy of the articles. On Friday, ^larch13th, the President appeared by his counsel before the Senateand requested forty days time in which to prepare and servehis answers to the articles. His counsel, as first named, con-sisted of Messrs. Evarts, Stanbery, Curtis, Nelson, and Black.